This plugin is meant to make the finding and sharing of Roving Threat locations easier. Locations are different each day and per server, they change at the usual 3AM servertime reset time. - A map for each region with markers at each possible location for the Roving Threats, toggle red if there is a RT there. - Coordinates are shown when hovering over a location. 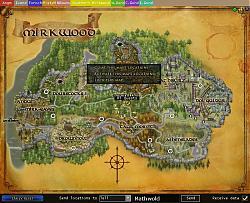 - Locations are saved between alting on one server. - Possibility to send the locations you have marked to chat channels. - Option to 'Receive data': if someone else send their marked locations, they will automatically be added to your map. - Toggle button to put anywhere on the screen to quickly hide/show the map. - Clicking the green dot will show your approximate location on the map. - Ctrl+clicking a location will send it to the group as the next target. - Alt+clicking a location will use a Waypoint command. Unzip the folder in your Plugins folder. This plugin does not depend on other plugins. Either use "/plugins load RTPlugin" to load the plugin, or load it via the Plugin Manager ("/plugins manager"). You will get a small toggle button to put anywhere on your screen, to show and hide the main window. Furthermore, you can use "/rtplugin" to show and hide the main window. In the main window, pick the area in which you are looking for the Roving Threats, and find the locations on the map. Hovering over the button will give you exact coordinates, clicking them will switch them from red to white and back, red for when there is a Roving Threat. Note that Roving Threats can walk around close to the coordinates. 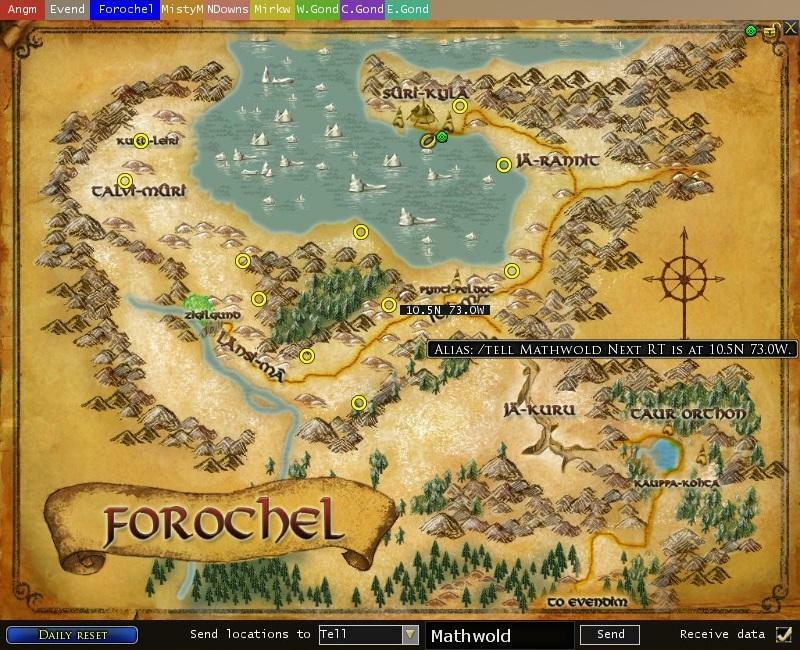 To send the locations of a given map to other players, select the appropriate channel, and in case of a Tell, type in a target, and click the Send button. If anyone receiving the message has the 'Receive data' checkbox activated, the coordinates will be added to their map (Note, this will not clear already marked locations, so you can search a map together). You can lock a map to avoid accidentally changing it by clicking the lock next to the close button, or by using the menu when right-clicking a map. When a new day starts, press the Daily Reset button to clear the locations (since the locations change every day) of all maps (this requires maps being unlocked). To clear or activate all locations on one map, there is a menu when right-clicking one map. For group leaders: you can ctrl+click the next location to send a message to the fellowship, raid, kinship, ... saying "Next RT is at <coords>.". Alt+click will use the Waypoint command to show the direction of the next coordinates. Clicking a green dot will put a marker on the map where you are (this will only refresh if you again click a green dot). Although I have not encountered a Roving Threat that was not on the locations of these maps, it is possible that some locations are not yet marked. Should you encounter such location, I'll be happy to add the location. Small bug fix that would prevent some people to load the plugin. - Localization: French and German clients should now see the map in their language (thanks to DToX). - Changed the Reset button to a Daily reset which clears all maps. Clearing one map can now happen via a menu right-clicking a map. Re: Error:Unable to parse file! I keep getting this message and it just won't load. do you plan to include the "Gorgoroth Roving Threats" ?? I uploaded a patch that adds a tab for "The Wastes". 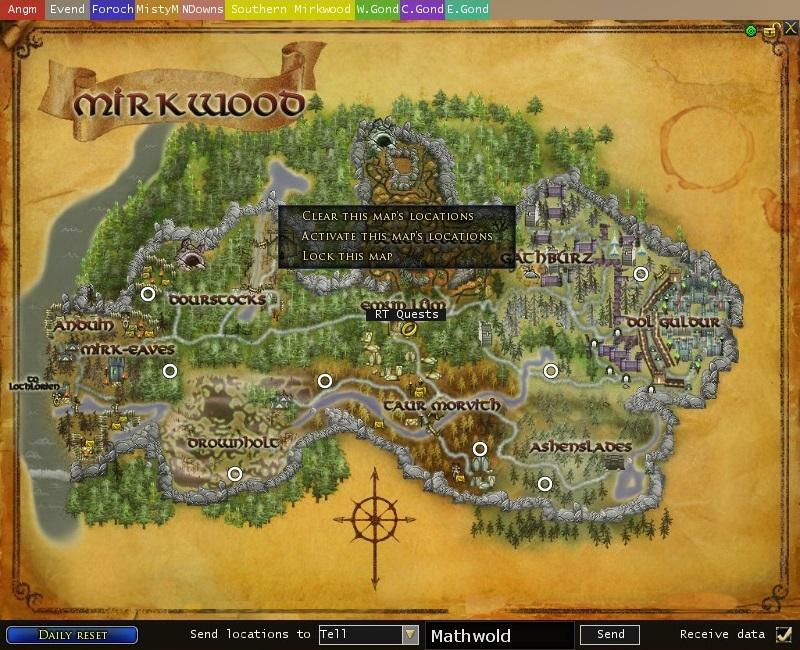 I only included the six spawn locations mentioned at lotro-wiki. I included Amoeborin's changes, except the Forochel location, which is almost right on top of an already-existing location. I did the German and French translations myself, so they may not be ideal. Last edited by Thurallor : 05-30-2017 at 05:31 PM. I have been busy, and well, it did not seem to be worth the hassle to update with just a few coordinates. I do intend to add the Wastes RTs map at some point, probably during summer. Until then, know that, as far as I've seen, the locations are quite limited (like: 7 spots for 5 RTs, I think), which is also a reason I didn't rush to update. 1) Load your favorite text editor (like Notepad on Windows - to see Line Numbers, turn Format | Word Wrap off, and View | Status Bar on). 3) Add this after line 40. Last edited by Amoeborin : 08-14-2016 at 01:48 PM. Hi and thank you for this nice plugin ! Last edited by Adra : 09-29-2015 at 01:39 PM. yup your right it was locked. thanks for bringing that feature to my attention. While in Angmar using this plugin I could not click on the spawn points to turn them red or send them to chat. I have not played in every area so I only know of just this one problem. 1) Thanks for this awesome plugin. Very useful ! Last edited by Seazoric : 08-07-2015 at 06:55 AM. You forgot the "-" signs on the last map coordinate for Eastern Gondor (in MapData.lua). As a result, one of the points doesn't appear on the map.